If you own a gift shop, clothing boutique or skincare studio and would like to carry some of our products, please contact us via e-mail at sonsa@cox.net. We don't wholesale our emulsions but we do wholesale soap, perfume, lip balm and other products that we make larger quantities of in advance. If your customers love artisan products and know the difference between natural and synthetic fragrance, we would like to talk to you, Please tell us what type of business you have and the products you're interested in and we can get started right away. Our minimum wholesale soap order is nine lbs (36 bars) of any six blends (6 bars each). Solid wood soap display can be finished in a dark stain (pictured), natural light wood with sealant or white crackle paint finish. For wholesale orders, each product must be purchased in increments of six with a $300 minimum total each time. 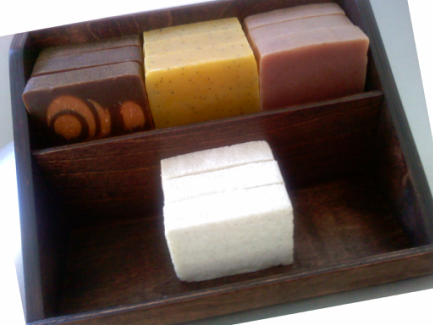 The wood display is sold at cost and may be purchased with any wholesale soap order. The display is optional and provided for your convenience. If you have your own display, that's perfectly fine. Ours may not go with your particular decor.